This help page is also available in PDF format here. The tool produces a complex figure, which summarises all relevant features of a set of glycan structures. For example, this figure summarises the structures of 640 N-linked glycans, from human tissue. 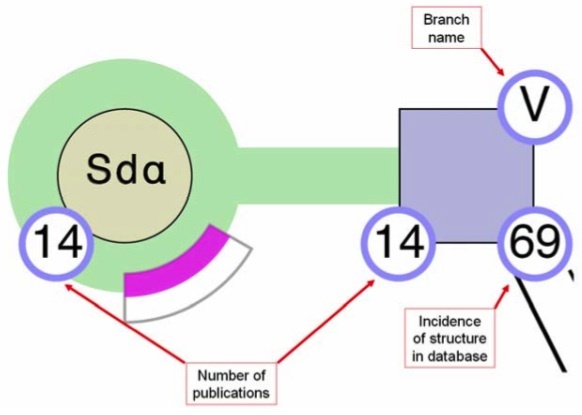 Residues may also be annotated to show the number of structures in the database containing a residue (bottom right circle, see figure below), number of publications reporting the residue in the structure (bottom left circle) and a label (V,W,X,Y,Z) that identifies a branch (top right circle). Linkages between core residues are given as black lines, labeled with anomer and ring substitution position (e.g. the β1-4 linkage, see below). 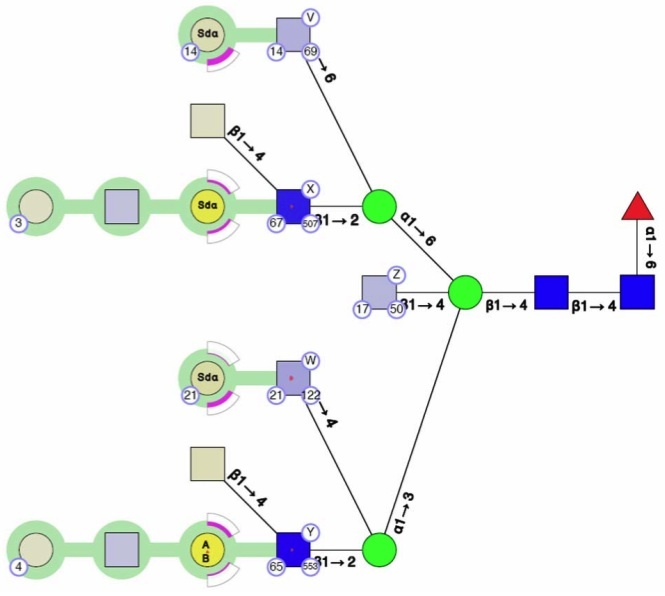 Linkages in chains have thick, coloured linking connections (e.g. green connections between residues, below, show a Type II chain). The vividness of a residue is indicative of the number of times it has been observed. Terminal epitopes upon chains are represented using arcs (NeuAc) and wedges (Fucose), however core fucosylation is shown by a standard symbol. Arcs show the degree of sialylation of a residue in a set of structures; the degree of fill in the arc correlates with the degree of sialylation. Wedges show the degree of fucosylation, with full fucosylation represented by a full wedge. Below is illustrated the different proportions of sialylation and fucosylation on a Gal residue. Two possible linkages of sialylation (α2-3 and α2-6) are positioned to the right, both below and above the residue, respectively. α2-8 sialylation is located above to the left of the residue. The annotation inside the residues of a chain (e.g. 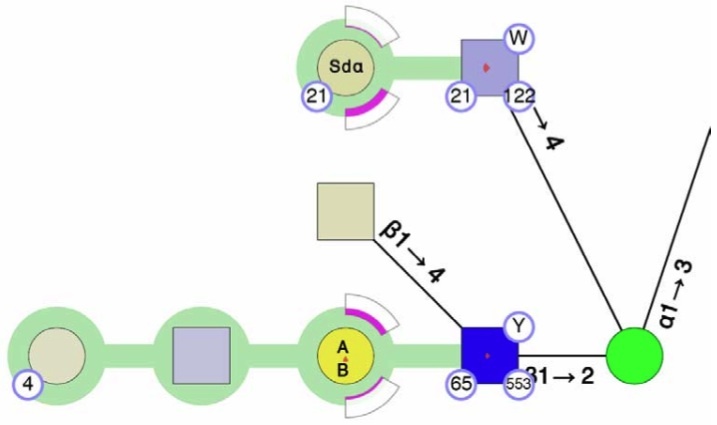 Sd^α, A or B) indicate terminal epitopes comprised of Gal and GalNAc residues. These can be clearly seen in the example, below. Histograms measuring the overall branching characteristics of the set of glycan structures are also generated automatically. These give a global view of branches in the structure set. One histogram is shown per labeled branch of the composite glycan structure. In this case, there are five branches (labeled V, W, X, Y, Z) and each histogram compares the number of times other branches occur with respect to that branch. Thus the histogram for branch V (histogram number i) shows that structures containing branch V can contain branches W-Y but do not contain branch Z. The other histograms provide similar data for all other branches (see graphs, below). The overall degree of branching in the set of glycans is shown in a second type of histogram (in this case, number vi), where the proportion of structures in the set containing 0, 1...n branches is graphed. It can be seen that in this case, the majority of structures have 2 branches, then 3. However some have either 0, 1 or 4 branches.